Concerns about foreign meddling in U.S. politics are nothing new. George Washington warned against the “insidious wiles” of foreign influence in his 1796 farewell address, and the infiltration of Nazi and Communist propaganda led to the passage of the original Foreign Agents Registration Act (FARA) in 1938. But the recent spotlight on Russian influence has demonstrated that the topic remains one of national concern. Over the last year Congress has attempted to improve FARA, and foreign influence rules in general, by introducing bills to address the complicated problem in a variety of ways. 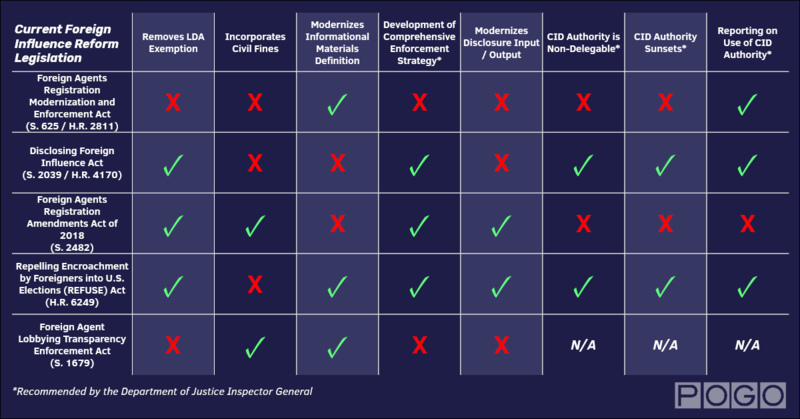 Many have incorporated recommendations made by the Project On Government Oversight and other civil society groups, as well as the Department of Justice Inspector General. POGO has analyzed each bill to examine how the changes could improve or diminish the rules governing those working to affect U.S. policies on behalf of foreign clients. Some bills would give the Justice Department powerful new investigative tools to enforce FARA, while others focus on changing more specific requirements or even shift some responsibilities to a different agency. Robust Congressional hearings on the proposals would help provide a fuller picture of exactly how each bill might affect FARA or the foreign-influence industry more broadly. Currently FARA is one of the only laws meant to regulate and provide transparency for the multi-billion- dollar foreign-influence industry. But a 2014 POGO investigation found that compliance with the law is staggeringly low and loopholes allow bad actors to slip through the cracks. Two years later, the Justice Department Inspector General completed an audit showing FARA compliance rates are “unacceptable” and painted a picture of an enforcement unit in disarray. Senators and Representatives have introduced several pieces of legislation focused on directly improving and updating FARA. Each of these bills would make sweeping changes to the law aimed at making it easier for the Justice Department to enforce it. Click here to view a full-size version of the chart. This bipartisan bill would grant the Justice Department civil investigative demand authority so it can more effectively investigate potential FARA violations. This authority allows the Department to compel potential registrants to provide documents and testimony on their activities. It’s an extremely powerful authority, and the Inspector General has raised concerns that it could easily lead to government overreach or abuse if used to target certain groups. The Inspector General has recommended that this authority come with certain safeguards and oversight mechanisms to prevent abuses of power. These protections include: making the authority non-delegable (meaning only one or two people at the Department would be able to use the authority), adding a sunset provision, and requiring mandatory annual reporting to Congress on the use of the authority. Of those protections, this bill only includes the mandatory reporting requirement. This bill also changes the definitions and filing requirements for informational materials. Generally, these materials are considered to be anything distributed by a FARA registrant with the intent to reach two or more people. But there is no formal definition for the term in the law. This bill would create an official definition of “informational materials” and adjust the law’s requirements to accommodate the role of social media. However, this legislation would also amend the filing requirement from 48 hours after the date of distribution to bulk filing once every six months, which would severely undermine the value of the law in promoting increased transparency regarding foreign influence through timely disclosure. This bill would improve FARA enforcement by requiring the Justice Department to develop a comprehensive enforcement strategy for FARA and related statutes. It would also remove one of the most commonly exploited exemptions to FARA, frequently referred to as the “LDA exemption” (Section 613, (h)). It’s an obvious loophole that allows those representing foreign companies to register their activities under the far less strict Lobbying Disclosure Act (LDA) instead of FARA. Since the law does not clearly distinguish between private foreign companies and those with close ties to foreign governments, people who should register under FARA can use the exemption to avoid doing so. This bill would eliminate the exemption entirely. But the crux of the bill is language to grant the Justice Department civil investigative demand authority and includes all three of the safeguards recommended by the Inspector General to prevent abuse of the power. However, the wording of the bill’s investigative power raises constitutional concerns . Currently the bill does not clarify that any information uncovered through the use of civil investigative demand authority would only be used in civil proceedings. Since FARA carries both civil and criminal penalties the ACLU and National Association of Criminal Defense Lawyers have raised concerns that the Disclosing Foreign Influence Act could violate the Fourth and Fifth Amendments. The Fourth Amendment requires law enforcement officials to show probable cause that a crime was committed and obtain a search warrant to obtain documents and other evidence in a criminal investigation. The language of the Disclosing Foreign Influence Act states that the Attorney General could use civil investigative demand authority to obtain that information if they have “reason to believe” someone might be violating FARA. It does not require a warrant issued by a judge and could therefore circumvent the Fourth Amendment if the evidence was used in a criminal proceeding. Further, by requiring potential registrants to provide oral testimony, the bill could violate the Fifth Amendment’s protection against self-incrimination. This bipartisan bill includes language that would remove the LDA loophole and grant the Justice Department civil investigative demand authority. As written, the authority does not run into the same constitutional issues as the Disclosing Foreign Influence Act, but it also fails to include the Inspector General-recommended safeguards to prevent abuse: non-delegable authority, a sunset provision, or mandatory reporting to Congress. It would also give the Department the authority to fine those who fail to register or disclose their activities as required under the law. POGO has long supported incorporating civil fines into the law to provide a more effective enforcement mechanism between a civil injunction and criminal changes that will help end the Department’s reliance on voluntary compliance. This is also the only FARA bill that would create an entirely new office within the Justice Department to administer FARA and all related statutes. Having a single office in charge will help streamline FARA enforcement and clarify what constitutes a prosecutable FARA case. The bill would require the Department to modernize the way FARA data is managed to make it a more effective system for the Department, FARA registrants, and the public. Like several of the other comprehensive FARA reform bills, this legislation would remove the LDA loophole and grant the Justice Department civil investigative demand authority. This bill includes all three of the safeguards recommended by the Justice Department Inspector General to prevent abuse of the civil investigative demand authority. But it may run into the same constitutional concerns as the Disclosing Foreign Influence Act. Unlike previous legislation, this bill would also tackle another FARA exemption that is often misinterpreted, willfully or not. The so-called “legal exemption” (Section 613, (g)) allows lawyers representing a foreign government or political party before a court of law to forgo registering. But since many lobbyists are also lawyers, the exemption can be misunderstood or purposefully exploited by people who should be registering under FARA. The REFUSE Act would require potential foreign agents to inform the Attorney General that they plan to claim the exemption, ensuring it is not being misused or abused. This bill also includes many necessary modernizations and updates to the Act, including adjusting the informational materials requirements to account for the use of social media in distributing. It would also require the Department to modernize its filing and disclosure systems to make them fully digitized and searchable. Currently, registrants can file their information electronically but the public cannot easily see or download the information. This far more narrowly focused bill would improve FARA enforcement and bring greater transparency to the covered activities by incorporating civil fines into the law and changing the disclosure requirements for informational materials. Specifically, the bill would require the filing and disclosure of informational materials sent by FARA registrants to any person, instead of only materials circulated to two or more people, as the law currently requires. It would also require those materials to include the name of each original recipient of the materials and the original date they were distributed. These two crucial pieces of information are not currently required in the filings, significantly restricting the oversight utility of the filings. A large number of registered foreign agents began their careers as high-ranking U.S. government officials, including as Members of Congress and White House employees. After leaving government, these officials wait no longer than the mandatory two-year cooling-off period before trading on their connections and influence for foreign clients. Eliminating this revolving door could help prevent undue foreign influence. Currently there are several pieces of legislation that would put limitations on those attempting to cash in on their former positions. This bipartisan bill would impose a lifetime ban on current or former Senators and Representatives from lobbying any current Member, officer, or employee of Congress, and would prohibit Members of Congress and Congressional committees from hiring a FARA registrant for a six-year period after the end of their last foreign agent contract. This bill would impose a lifetime ban on former political appointees from engaging in any FARA-covered activities. The term “political appointee” includes certain senior political officials compensated on the Executive Schedule; limited-term, limited-emergency, and non-career appointees in the Senior Executive Service; and employees in confidential or policy-determining positions in the excepted service. This bill would not ban the foreign-lobbying revolving door outright, but it would make it significantly less attractive. It would prohibit former Members of Congress and former senior Congressional employees from receiving certain federal benefits, such as the Thrift Savings Plan and Health Benefits Program, if they go on to receive compensation for any activities that would require registering under FARA. All too often, methods of foreign influence extend far beyond FARA’s reach. In particular, as information distribution has changed and become more digital and therefore more global, FARA has failed to keep up. In response, Congress has introduced legislation that would amend the Communications Act of 1934 to adjust the disclosure requirements for foreign-based media outlets. Although FARA requires some media outlets to register and disclose information about their political activities, the law lacks clarity on what triggers that registration requirement. These bills would instead create a new requirement, overseen by the Federal Communications Commission instead of the Justice Department. This bill would require broadcast, cable, and satellite providers to record and submit to the FCC specified information about requests by a foreign agent to broadcast content that is intended for American consumers. It further requires that such content include a statement that it’s being distributed on behalf of a foreign government when it is aired. This bipartisan bill would require U.S.-based foreign media outlets to submit a report to the Federal Communications Commission every six months that contains: (1) the name of the outlet, and (2) a description of the outlet’s relationship with its foreign principal, including the legal relationship and funding the outlet receives from the principal. The Commission must transmit a summary of such reports to Congress and make the reports publicly available. And like the Foreign Entities Reform Act of 2018, it would require a statement that such content is produced or distributed on behalf of a foreign government.